Bumbling pirates, funny mermaids, and the tale of an orphan boy all can be found in the University of Lynchburg’s fall production of Peter and the Starcatcher, the prequel to J.M. Barrie’s classic Peter Pan story. Peter and the Starcatcher opens at 7:30 p.m. Thursday, October 18, in Dillard Theatre. Additional performances will be held at 7:30 p.m. Friday and Saturday, October 19 and 20, and at 2 p.m. Sunday, October 21. The two-and-a-half hour play is recommended for adults and children over the age of eight. Tickets are $5 for students, $15 for adults, and $10 for seniors (60+), and can be purchased at etix.com. The play, written by Rick Elice, is based on Dave Barry and Ridley Pearson’s novel Peter and the Starcatchers. The University of Lynchburg theatre department combined the slightly different stories in the novel and the play to develop a unique production. Evans added that she loves how the play is relatable to both adults and children alike and there is something for everyone at any stage of life. 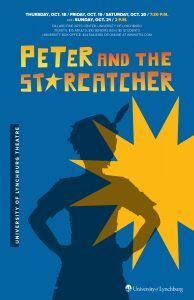 Peter and the Starcatcher is a story about going on a mission to find a home, all while growing up and coming into your own. The play takes place in 1885 Victorian England, when an orphan is sent to a distant island on the same ship as the smart Molly Aster. The ship holds precious starstuff, a powerful substance. Pirates take over the ship, forcing Molly and the orphan boy to protect the starstuff. This quickly turns into a journey that helps each character find their own home in this world. The cast and crew includes 17 onstage actors, three stage managers, 12 backstage helpers, two people in the box office, and four people in the costume shop, plus all of the directors and professors helping to direct and choreograph. Even with all of these people, cast members play multiple characters and almost everyone is on the stage at all times. Also, some roles were gender bending. Bosinger’s character, Black Stache, for example, is typically played by a male.